The summer honey flow is the time of year when honeybees bring back an overabundance of nectar to the hive. 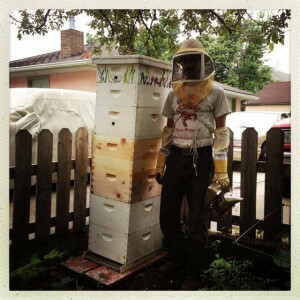 As bees bring more and more nectar back to the hive, we keep adding boxes, known as supers. By the end of summer, hives can be quite tall. Some of our hives are taller than me. Honeybees gather nectar from flowers to eat and to feed to their queen and their young. When bees gather more nectar than they can eat, they store it in the honeycomb, dehydrate it for preservation, and cap it with wax. Enzymes from the bees’ stomachs interact with the nectar and make delicious honey. Bees prefer certain flowers to others based on their abundance and nectar content. The seasonal cycle of blooms creates different honey flows. There is a spring, summer and sometimes a fall flow. Spring honey flow occurs when the fruit trees bloom. Apple, crab apple, pear, you name it. This is a crucial moment for honeybees, as it is the first opportunity for them to gather a large amount of nectar and pollen after the long winter. The health of their brood (the pupae and larvae) depends on good pollen-rich food. The summer honey flow is the whopper. It varies from year to year, but generally occurs in early to mid-July and can last for weeks, depending on how much rain there is, how many flowers there are, and other environmental factors. During this time, hives can have 2, 3, 4, 5 or more honey supers added to them to accommodate the massive influx of nectar. The queen will also lay more eggs and to increase the population of the hive to meet the demands of the honey flow. A strong hive can have upwards of 60,000 individual bees in it during the main honey flow. Sunflowers, sweet clover, alfalfa, milkweed, spearmint, cosmos, zinnias, bee balm and other mid-summer flowers are among the bees favorites. A fall honey flow is sometimes fairly strong, sometimes mediocre, and sometimes almost non-existent. This flow depends on temperature, weather and blooms. Golden rod and asters are main contributors to this flow. There are many maladies affecting the modern honeybee. We believe one of the best defenses is to provide honeybees with the food sources they need to be healthy and robust. We hope you consider planting some pollinator-friendly flowers in your yard or garden. ← Bee Bearding — it’s a real thing.